Maybe you remember my post about the Cardona castle where we talked about this jewel of Catalan history, maybe the most emblematic medieval castle in Catalonia. 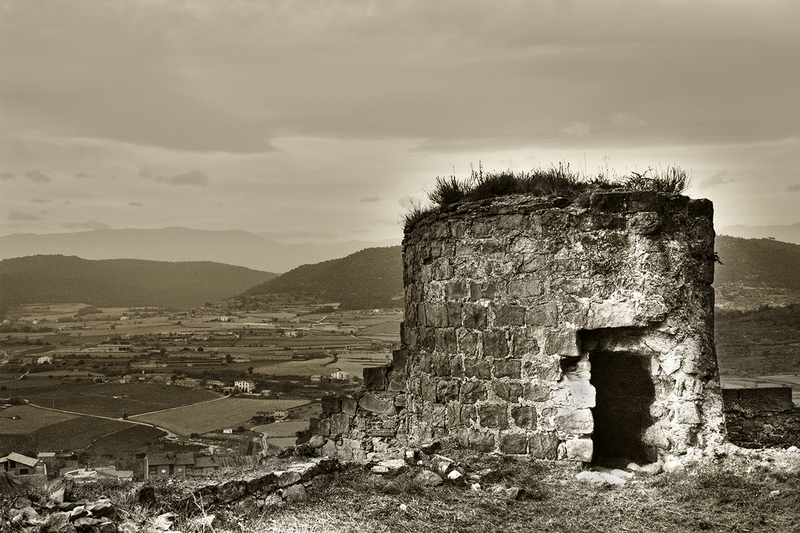 An inexpugnable stronghold under siege on many occasions but never conquered by force and devoted to protect not only its illustrious lords, the Cardona family, but the salt mines in the valley nearby. A very good sample of the evolution of defensive techniques from medieval to modern times in our country. It is precisely the last fortress to surrender to Philip V troops, the last redoubt of the Catalonian supporters of Charles VI of Austria in the War of the Spanish Succession, in 1714. The remains of a small tower outside the castle talk of its privileged location on top of a promontory and make us think of a thousand battles. The choice of b/w really makes this a striking image. The remains of the old fortress looks great here. It seems to say: "I have done my duty, now let me enjoy the sight of this beautiful land". Nice. The sepia tones are poignant and beautiful for this one. There is something so touching about the grasses growing on top of the fortress. A wonderful image, Carlos. Very nice, and I like the b/w too.